Zerohedge readers who follow our monthly consumer credit updates already knew, aggregate household debt balances jumped in 4Q18. As of late December, total household indebtedness was at a staggering $13.54 trillion, $32 billion higher than 3Q18. To understand the American credit card debt crisis, real estate data company Clever surveyed 1,000 credit card users earlier this month. Using Consumer Financial Protection credit card complaint data and other forms of consumer metrics, the company was able to gain tremendous insight into the average American’s purchasing habits, dependence on credit cards, and feelings about their debt situation. The survey found that 47% of Americans have a monthly balance on their credit card. 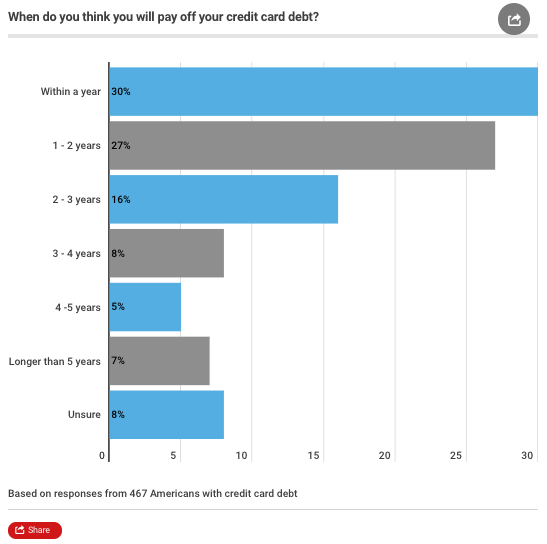 About 30% of respondents with credit card debt believe they'll extinguish the debt this year, leading many of the respondents stuck in an endless debt cycle. 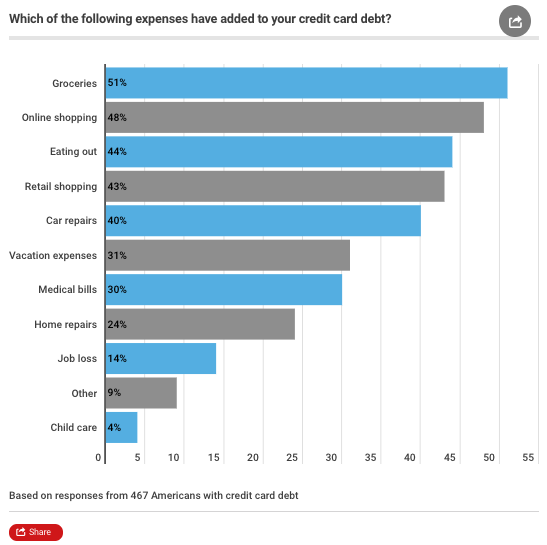 Fifty-six percent of the respondents say they've had credit card debt for more than a year. About 20% estimate their debt will be paid off by 2022, while 8% were unsure about a timeline. “It’s a big issue,” Ted Rossman, credit industry expert for CreditCards.com, tells CNBC. With credit card APR soaring to about 17.64%, a new high, the interest accrued on monthly balances can quickly add up and trap unsuspecting consumers with insurmountable debt. The U.S. recovery has been the slowest since WWII. Consumers have been stuck in the gig-economy with low wage and skill jobs. Their wages have not been able to outpace rapid inflation in groceries and rent. So many have resorted to credit cards to supplement their daily expenses. This is especially prevalent with lower-income families, defined here as those earning less than $50,000 a year. Buying groceries” ranked as the top expense that racked up people's balances, the survey said. About 28% of respondents say they're fully dependent on credit cards to pay rent and utilities. Surprisingly, there is some good news. 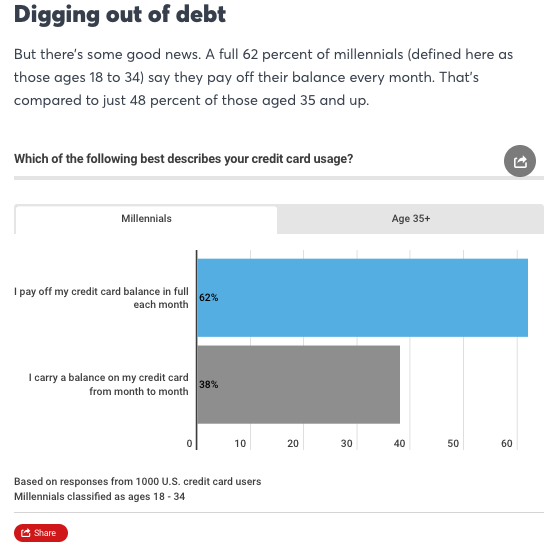 Sixty-two percent of millennials indicate they pay their balance every month. That's compared to just 48% of Generation X and Baby Boomers. Credit cards are an integral part of developing credit and proving creditworthiness. 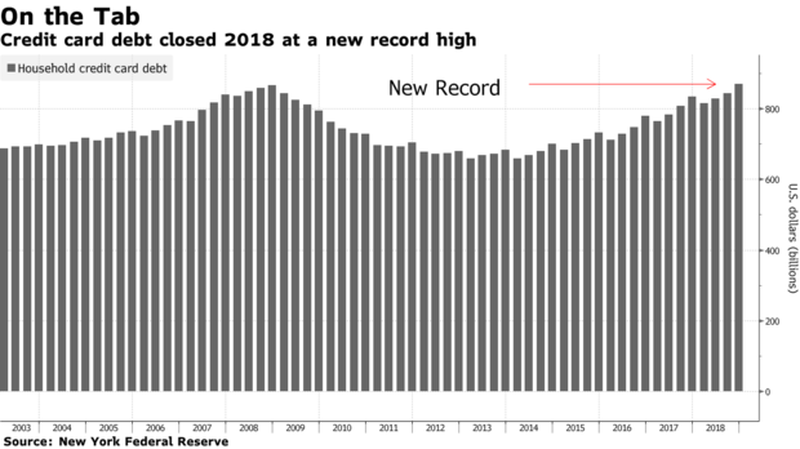 Multiple reports show the consumer is on the cusp of a dangerous deleveraging, an ominous sign that the credit cycle has likely turned. Winter is here.